Why choose what you are going to watch next when you can let the algorithms decide for you? The question is, which recommendation engine are you going to trust? The built-in tips served up by iTunes, Spotify et al aren't quite as robust as they could be, and sometimes you want something a little more advanced. 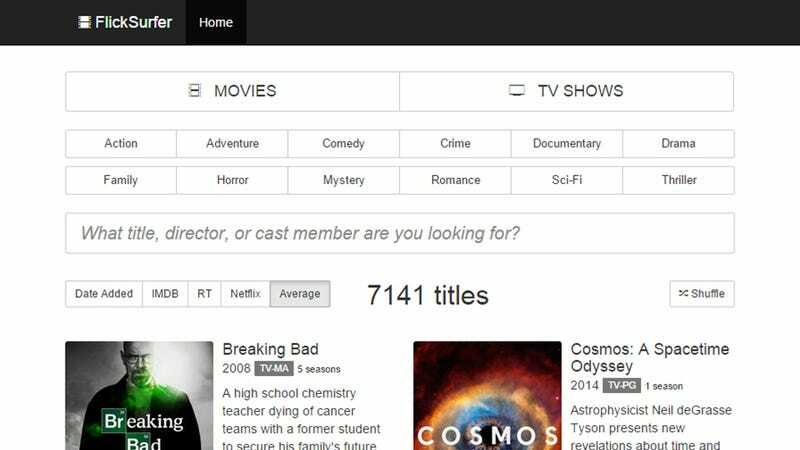 FlickSurfer is a clean, intuitive web app for surfacing the best content from Netflix for you. Make your way over to the FlickSurfer home page and there are no login processes to go through, just a set of filtering options. You can switch between movies and TV shows or see everything at once, and 12 genres are listed below for your perusal. There's also a search box to look for a title, director or cast member directly, and results can be filtered by date or rating. Click on a title to see more about it, including a synopsis. FlickSurfer's main trick—aside from its zippy, clutter-free interface—is the way it pulls in information from the IMDB and Rotten Tomatoes as well as Netflix's own data. That gives you a broader idea of just how decent (or otherwise) a show or film is going to be. Some personalization options would be helpful further down the line but for now it's a step up from Netflix's own interface.